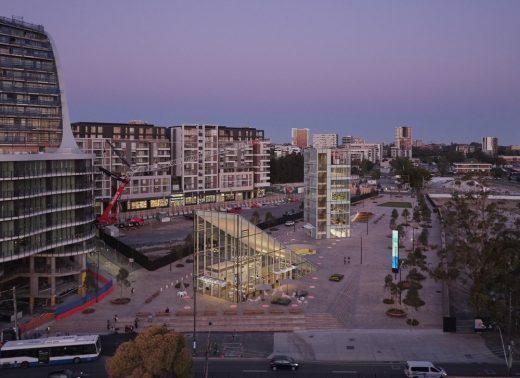 PUBLIC BUILDING OR PUBLIC SPACE? A visionary civic project by Sydney architects Stewart Hollenstein (in association with Stewart Architecture) delivered for the City of Sydney Council is now open in the new city district of Green Square. 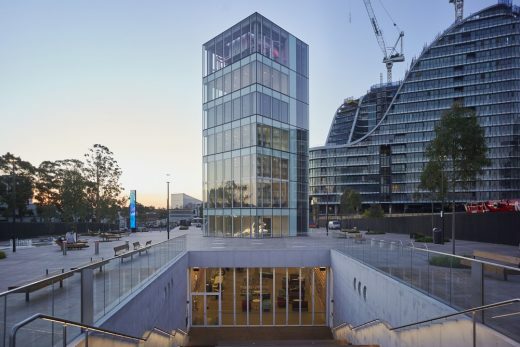 Consisting of a subterranean main library and a series of jewel-like above-ground sculptural building forms, the project creates a highly animated 8,000 sq m public plaza at ground level in the first new town centre in Sydney in over 100 years. 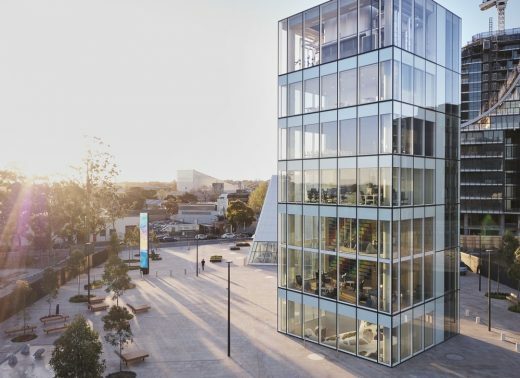 The 3,000 sq m naturally-lit library is located at the heart of Australia’s largest area of urban renewal, and will provide a focal point for 60,500 new residents planned for the ultra-high density 278 ha district over the next 10 years. 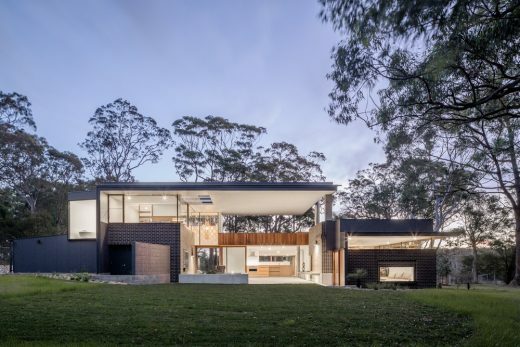 Won through an anonymous global design competition, Stewart Hollenstein’s design was selected unanimously by a jury including Glenn Murcutt. The competition brief called for two distinct components – a public plaza and a library. In a unique design response, Stewart Hollenstein’s concept instead fuses these elements. By creating a largely underground library – with selected building elements and functions emerging animatedly to the sky – the project makes space for outdoor activities at ground level, maximising the potential of the public plaza by retaining vistas through the site and leaving space for public events. The project strategically places a series of highly legible forms – circular, triangular, rectangular and trapezium – to create social spaces for indoor and outdoor community-focused library activities. The geometry of the design is intentionally loose and informal – establishing a sense of shared territory for multiple uses. The design encourages adaptation to accommodate both the evolution of the library and an expanding population. Photos below by Tom Roe, courtesy of Stewart Hollenstein Pty Ltd. 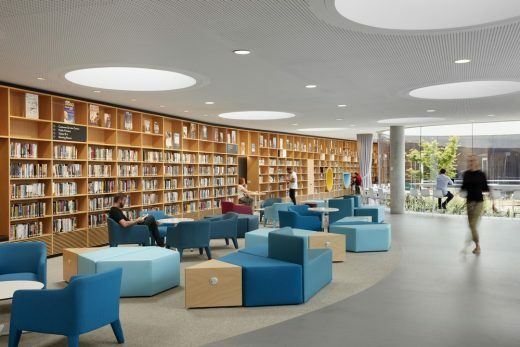 The design challenges the traditional concept of the library as a receptacle for books, being conceived instead as a series of spaces for engaging with knowledge and learning. 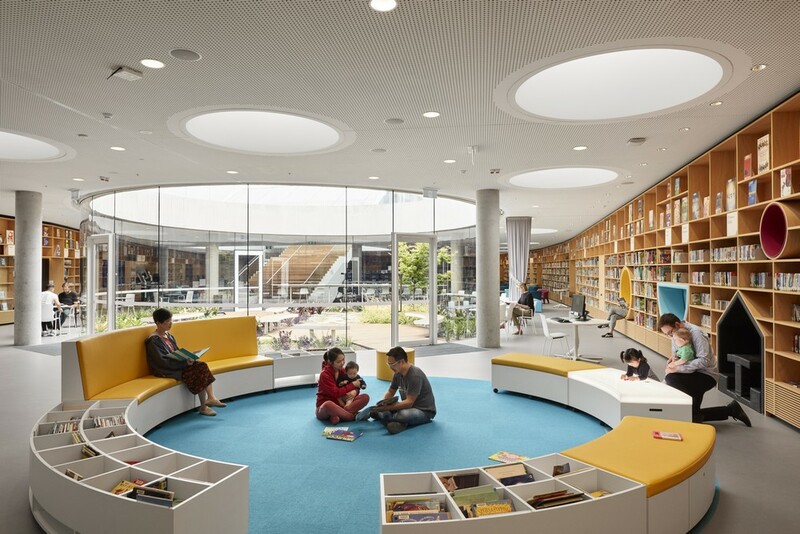 Internally the main library space is organised around the central focus of a sunken garden rotunda, punctured into the volume from above. This protected, lushly planted circular garden is accessible from the library for outdoor reading, and incorporates a ‘story tree’ and children’s reading circle. 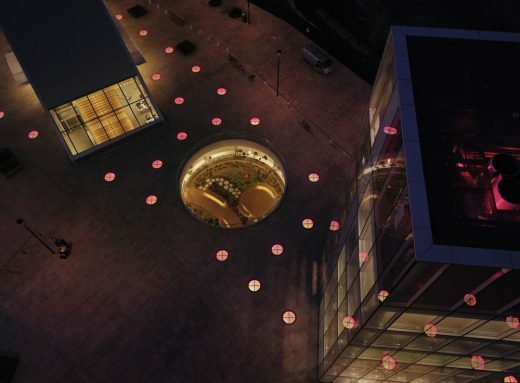 Thirty-nine circular skylights (each 1 m diameter) dotted into the plaza groundscape deliver filtered natural light and fresh air to the haven of the underground library hall. 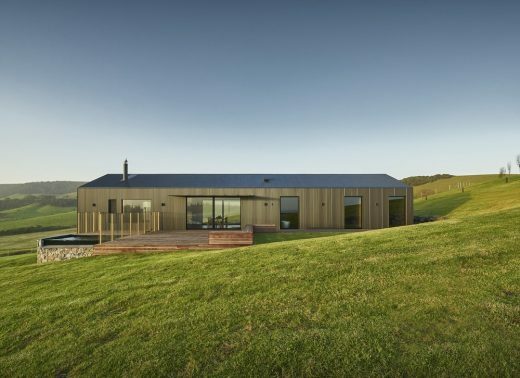 Natural light, air and access is also delivered via the protruding volumes. 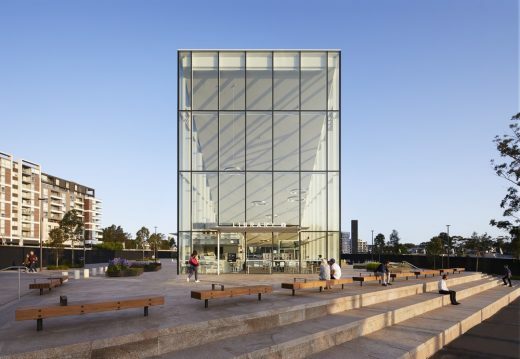 A wedge-shaped glazed pavilion announces a lofty and transparent entrance hall and provides an active public interface for the library, accommodating a café that spills out onto the plaza as well as news and magazine sections, information point and self-check-out machines. 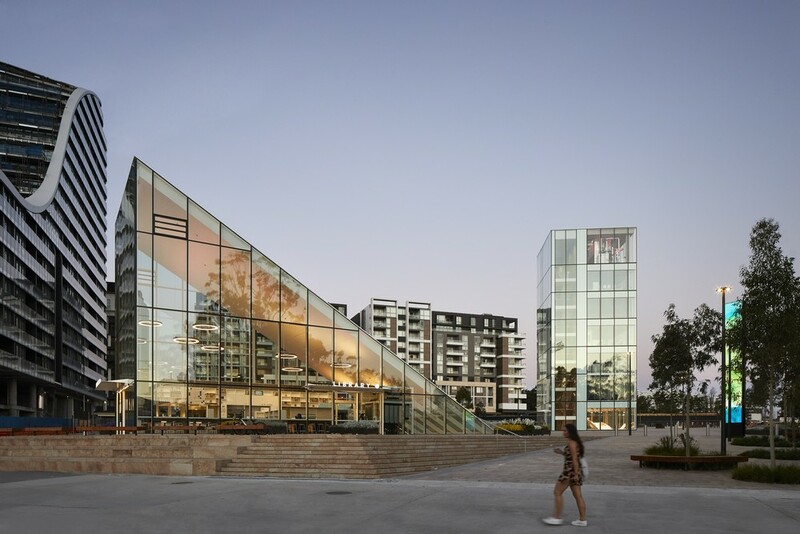 The triangular entrance pavilion is designed to operate independently from the main library when necessary, with longer public hours. 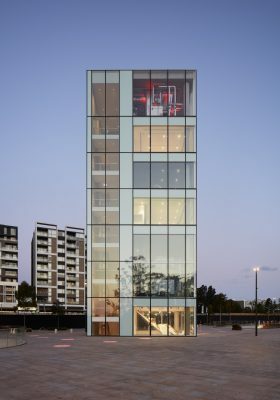 A separate, beacon-like glazed tower stacks a series of community and library functions that by nature require separation. Over six storeys the 11 by 11 m tower floorplates incorporate a double-height reading room (with suspended mezzanine level), a computer lab for teaching (coding, robotics and 3D printing), a ‘black box’ theatre and sprung floor music room for practice and performance (from mixing decks to baby grand piano), and a flexible, bookable community space called the ‘Anything Room’. 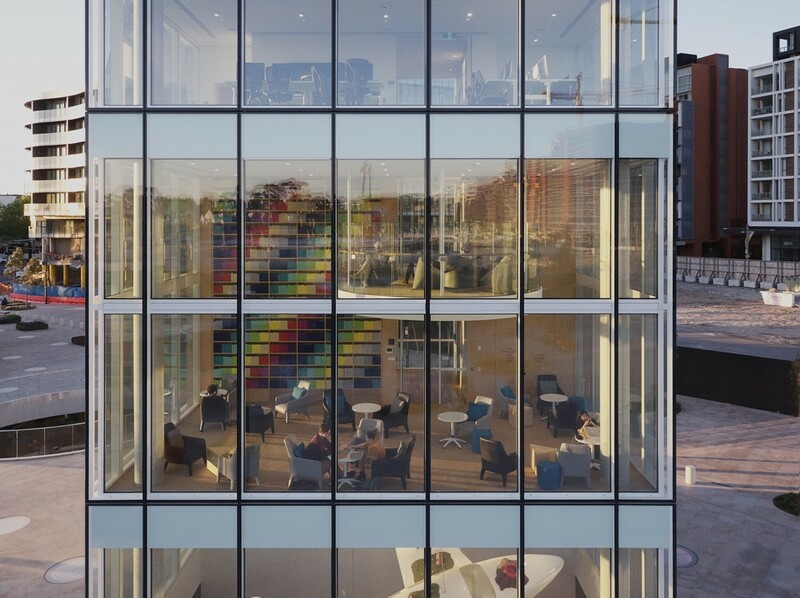 A sociable computer lab above encourages young and old to access computers, software and training, and there is a boardroom space on top. 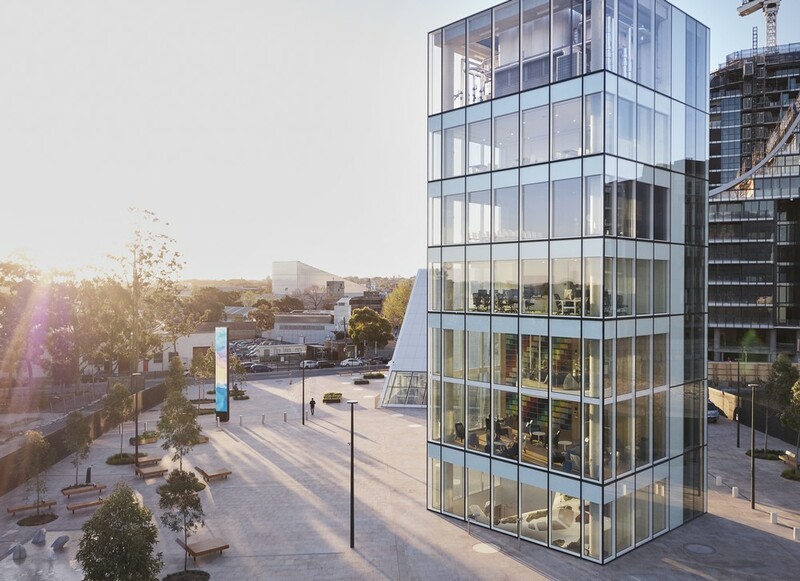 Like the entrance pavilion, these facilities are designed to be accessed separately, outside of main library hours with keypad access.The building’s colourfully-lit plant is perched on top of the tower in a transparent enclosure – a highly visible reminder of the project’s sustainable focus, which has been awarded a 5-star rating from the Green Building Council of Australia. 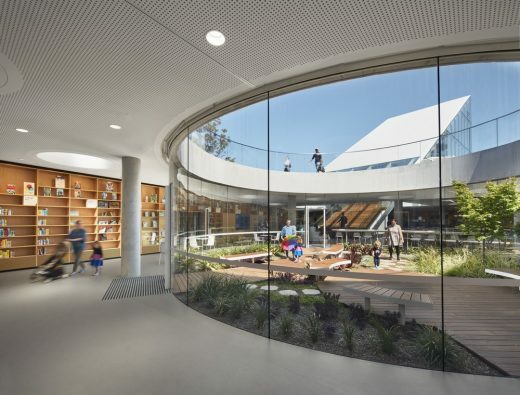 In response to the Sydney climate, library functions overflow into an outdoor plaza ringed with groves of lemon-scented Eucalyptus trees. 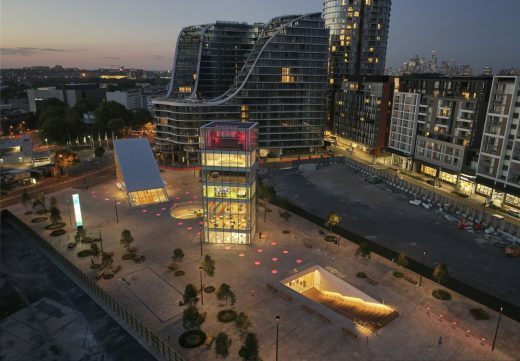 The canopies of this lofty specimen, which grows to approximately 35 metres in height, will eventually moderate the scale of adjacent buildings, provide shade within the plaza, and create seasonal character though changes in bark and foliage. A sunken, trapezium-shaped external amphitheatre doubles as the rear library entrance and provides a green-walled retreat for outdoor performance (book readings, cinema and community theatre), while extensive public seating is incorporated into steps created by a leveling of the western end of the site. The plaza also features timber sun loungers with built-in power outlets, eucalyptus trees, a large lawn area and the cooling fountains of a water play zone for children. The library also hosts two new public artworks commissioned by the City of Sydney. 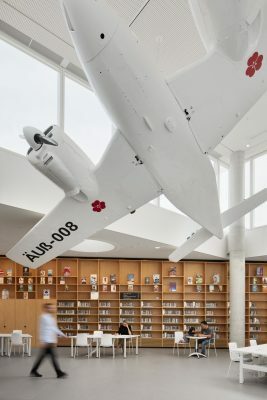 Cloud Nationby Claire Healy and Sean Cordeiro is a repurposed vintage aircraft suspended from the library’s ceiling (the plane’s wings feature a Lilliputian island, and visitors are given monoculars to inspect the small-scale model more closely). High Waterby Michael Thomas Hill and Indigo Hanlee of Lightwelltakes live data every minute from local weather sensors and the web, transforming the LED surface into a moving digital paintingthat responds to the sun, wind and other meteorological conditions. 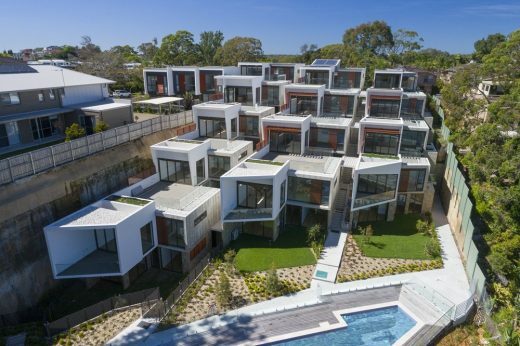 Stewart Hollenstein is an Australian architecture and urban design practice established in 2010. 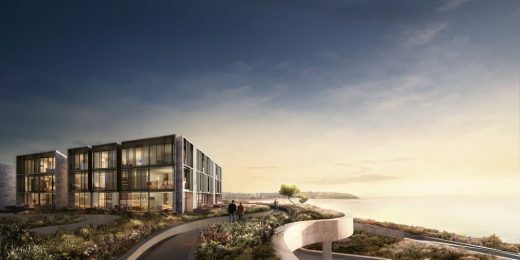 The studio is committed to addressing the challenges of contemporary society in highly innovative and inventive ways through the design of unique built environments. Directors Matthias Hollenstein and Felicity Stewart combine a broad range of experience gained both in Australia and overseas. The studio environment of the practice creates a dynamic arena where ideas can be tested and boundaries pushed. The practice works with a specific agenda to place the human experience at the centre of the design process, and begins each design venture by defining the aspirations that will drive the design process forward. 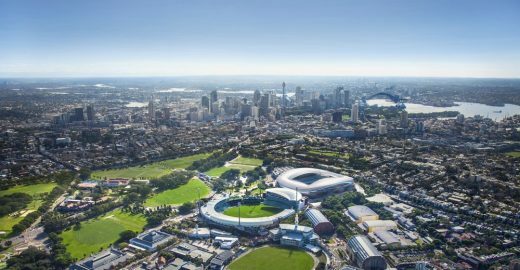 Stewart Hollenstein are currently working on projects ranging from product design to large-scale masterplans for clients including City of Sydney, Lendlease, NSW Department of Planning and Environment and Merivale.